This recipe reminds me of home when I was growing up, which is one reason I often make this when I have the ingredients on hand. 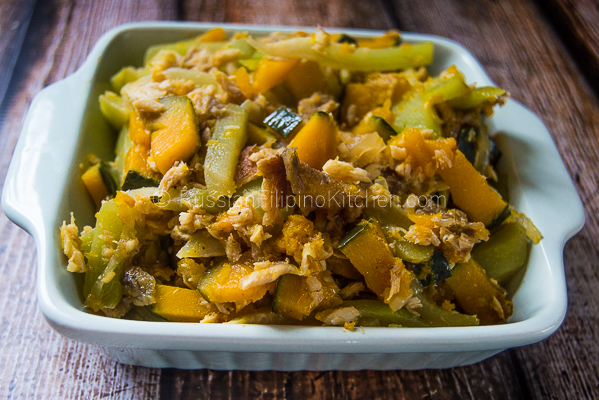 It is one healthy dish you can try that’s quick and easy to put together. If you have kids, this is also great way to introduce them to eating veggies and fish. Back in Philippines, my family’s daily meals consist mainly of rice, fish, vegetables, and fruits, which to my opinion, is way better and much healthier than my current eating habits which puts more meat onto the plate than vegetables and fruits combined. Anyway, I use shredded fried tilapia to add extra flavor to the dish. You can use any fish you like. Fry it up first, then carefully separate the flesh from the bones and set aside. For the rest of the recipe, read on and happy cooking! 1. Use a spoon to remove seeds from the squash. Rinse under cold running water and pat dry with a paper towel. 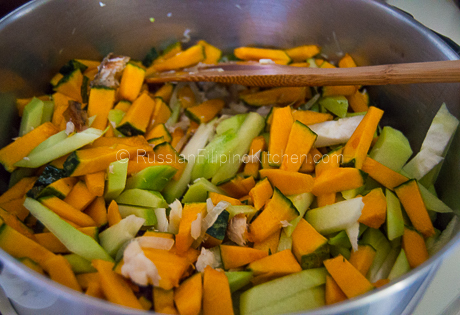 Peel squash if you want using a vegetable peeler or a small knife, but it’s not necessary because they’re edible. Personally, I love them not only for its taste but also due to its high fiber content, vitamins, and minerals. 2. 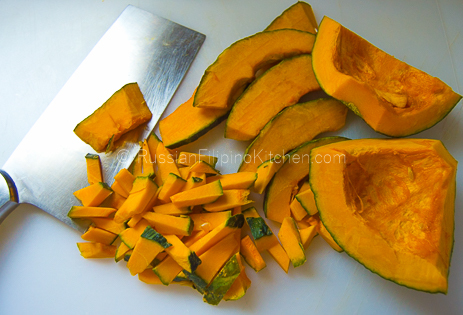 Slice squash into ¼ inch thick, then slice further into strips. Use a sharp and/or heavy knife for this task since the flesh is a little hard to cut through. I use a cleaver knife on this one. 3. Cut, peel, and deseed chayote. Slice into ¼ inch thick lengthwise, then into strips as well. 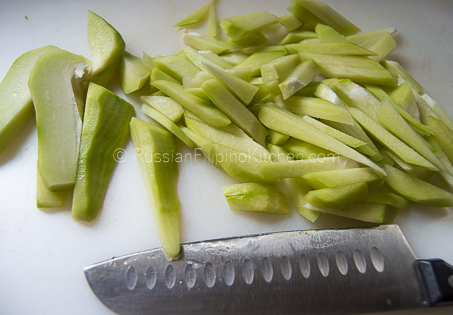 You can use a regular kitchen knife since chayote flesh is soft. 4. Peel and slice onion. 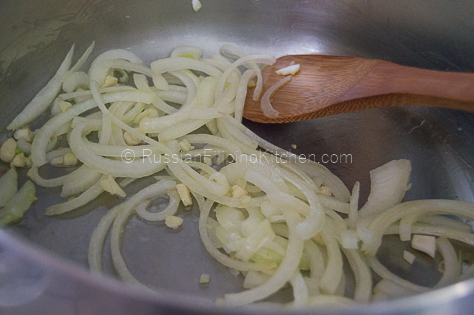 Smack garlic with the flat side of your knife to loosen the skin, then peel and mince. 5. Heat up a sauté pan or cooking pot over medium high heat. Add the oil and sauté onions and garlic until onions are translucent and garlic has browned a little, about 2 minutes. 6. 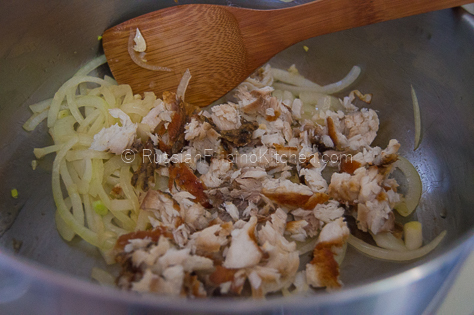 Add the shredded fish and sauté for another minute. 7. 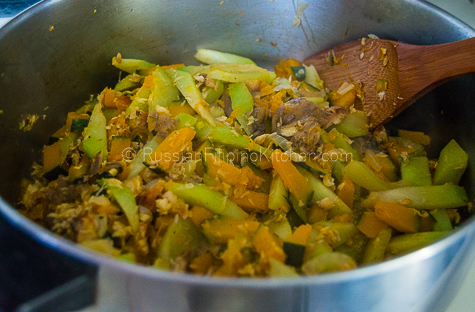 Throw in sliced chayote and squash and sauté for a minute or two. 8. Season with soy sauce, salt, and ground black pepper. Mix. 10. Cover and bring to a boil, then simmer on medium low heat until vegetables are thoroughly cooked and water has evaporated, approximately 10 minutes. 11. 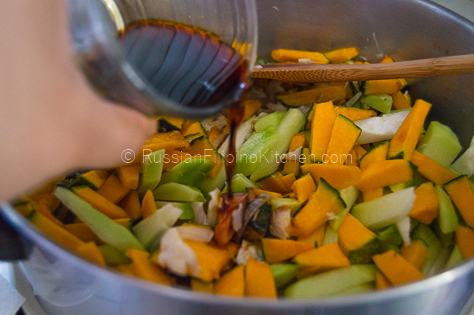 Remove from heat, and allow to cool a little before serving. 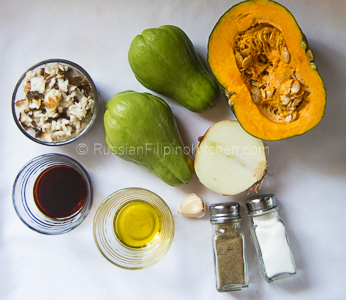 Use a spoon to remove seeds from the squash. Rinse under cold running water and pat dry with a paper towel. Peel squash if you want using a vegetable peeler or a small knife, but it’s not necessary because they’re edible. Personally, I love them not only for its taste but also due to its high fiber content, vitamins, and minerals. 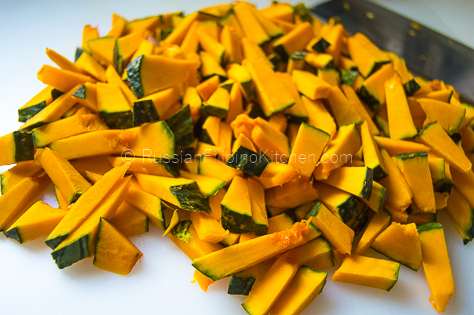 Slice squash into ¼ inch thick, then slice further into strips. Use a sharp and/or heavy knife for this task since the flesh is a little hard to cut through. I use a cleaver knife on this one. 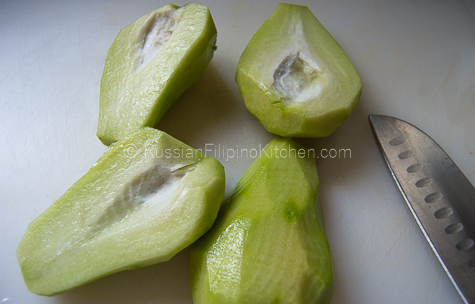 Cut, peel, and deseed chayote. Slice into ¼ inch thick lengthwise, then into strips as well. 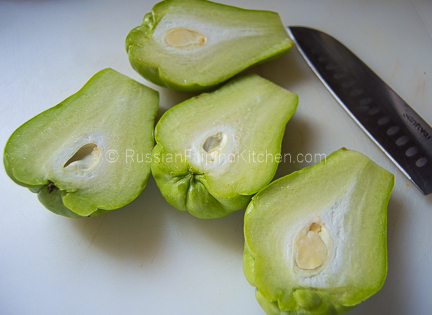 You can use a regular kitchen knife since chayote flesh is soft. Peel and slice onion. 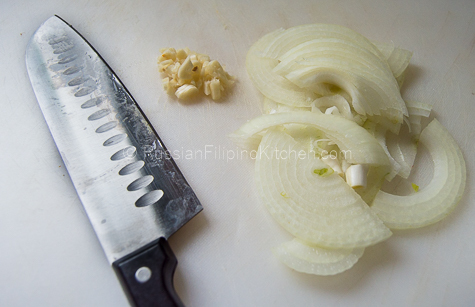 Smack garlic with the flat side of your knife to loosen the skin, then peel and mince. Heat up a sauté pan or cooking pot over medium high heat. Add the oil and sauté onions and garlic until onions are translucent and garlic has browned a little, about 2 minutes. 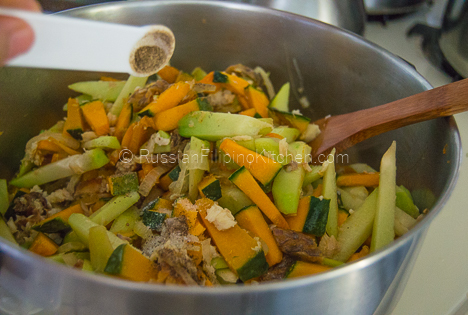 Add the shredded fish and sauté for another minute. 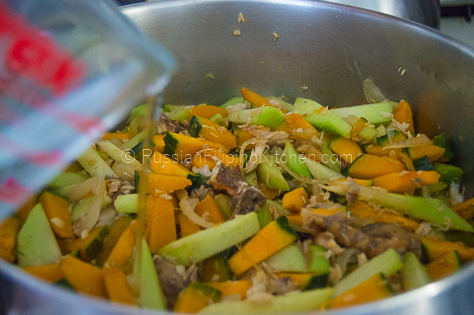 Throw in sliced chayote and squash and sauté for a minute or two. Season with soy sauce, salt, and ground black pepper. Mix. Cover and bring to a boil, then simmer on medium low heat until vegetables are thoroughly cooked and water has evaporated, approximately 10 minutes. Remove from heat, then allow to cool a little before serving. 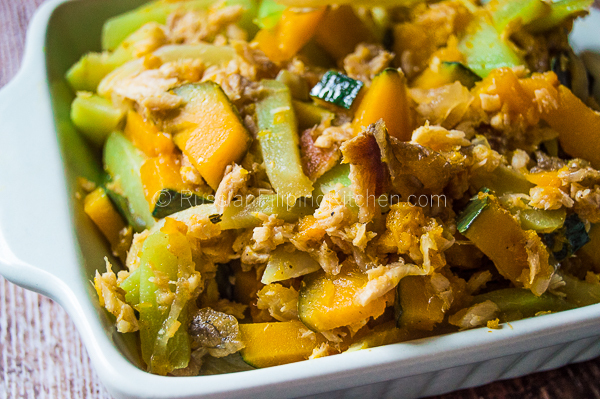 This looks amazing, I can’t wait till kabocha is in season here to try it out. Thank you so much for sharing your recipe! You’re welcome and thanks as well for visiting!